There's a new venue starting in Fairfax! 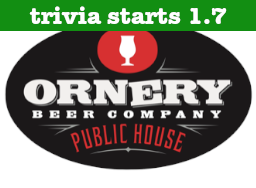 Join us Monday (starting 1.7) at 7pm at Ornery Beer Company. Your team will start accumulating points & can qualify to win $5000 cash!